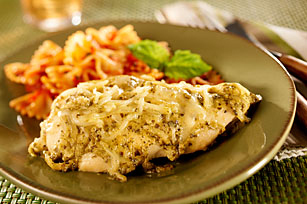 Serve up savory Italian flair for an entrée with our Pesto Chicken Recipe. With pesto, Dijon and mozzarella, this Pesto Chicken Recipe will hit the spot. Mix 1/4 cup cheese, pesto and mustard until blended. Place chicken in 13x9-inch baking dish; top with pesto mixture and remaining cheese. Bake 20 to 25 min. or until chicken is done (165°F). Prepare using GREY POUPON Country Dijon Mustard. Serve with a side of your favorite hot cooked pasta.